As a full-service Destination Management Company and Tour Operator / Wholesaler specialized in Latin America since 1989. EcoAmerica Tours focuses on a small part of the world: Central and South America, featuring only selected countries such as Argentina, Belize, Brazil, Chile, Costa Rica, Ecuador and The Galapagos Islands, Guatemala, Panama, and Peru, and are not distracted promoting, marketing and selling a diverse mix of other places. Our exotic destinations are very well known the world over for their diverse and rich rainforests, beautiful deserted beaches, breathtaking active volcanoes, wild virgin rivers, mysterious archeological sites, colorful markets, ancient cultures, unique flora and fauna, fascinating cosmopolitan cities, charming little towns, quaint villages, alpine-like tree lined lakes, millennium old glaciers, and so many other beautiful and interesting attractions. While many travelers prefer to customize their vacations, there are some who prefer to take advantage of our independent, well organized and value priced EcoAmerica Tours, which allow them to enjoy a hassle-free vacation without worrying about anything else. 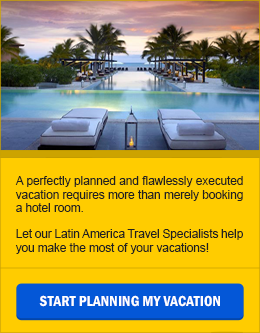 After more than two decades of planning and executing Latin America Tours, we certainly are specialists in each one of these exciting destinations and know first-hand what works best to provide our guests with exceptional vacation experiences. Read what our Guests are saying about our Services, and take Advantages of our Full Service Platform. We are also a Better Business Bureau accredited business. 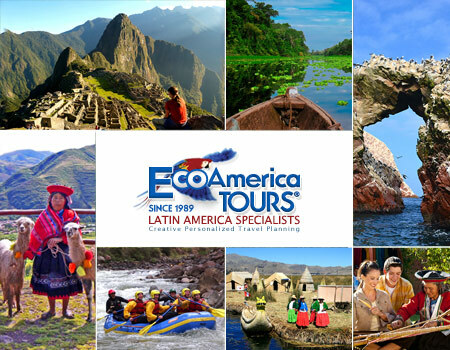 As a Destination Management Company, for all of us at EcoAmerica Tours our mission is to create and deliver extraordinary experiential journeys in Latin America through tailor-made itineraries filled with real activities and features, taking care of every detail to provide our guests with enriching and inspirational travel experiences. Integrity. Integrity is the cornerstone of our company; it is what gives us a solid foundation to build and sustain trustful relationships with our clients, colleagues, vendors, and local communities. Knowledge. Knowledge is what makes us different and stand out in our area of expertise; it is what gives us all the necessary elements that a true destination specialist has to have. We concentrate our efforts in only a small part of the world in order of being able to provide our clients with the best possible advice and recommendations. Whenever we suggest a destination, a hotel, an attraction, is because at least one of us or our local partners have been there and have done that! Passion. Passion is our main motivation; it is what moves us day after day to continue learning about our exciting destinations and each one of the hotels and attractions we recommend. Dedication. Dedication is the engine that keeps us moving in pursuing excellence; it is what allows us to grow and improve continuously. We know that to be successful in our business we must work harder than anybody else, think outside of the box like nobody else, and perform and deliver to not only meet but exceed our guests’ expectations by always going above and beyond the standard. Our Vision: Our Vision is to strive to provide the finest of experiences to become the Latin America Specialists Preferred Supplier while fervently sharing our commitment to excellence in the delivery of services. Our vision focuses in our continuous search of excellence while staying true to our core values: by letting integrity rule the way we do business, our knowledge combined with our passion and enthusiasm will keep on building stronger bonds and confidence between us and our clients. Would you like to start planning your next vacation? We would love to assist you in planning your perfect and unique journey!